There was a bit of positive news for High Street store owners today. Research (via the BBC) has suggested that the number of shops closing down has fallen to its lowest level in the last seven years. On top of this, there were 2,342 shops opened. Great news for town centres. However, we all know the joys of online shopping. Not a day goes by that I don’t see DHL, Yodel or Parcelforce vans in the area, delivering goods. Everything from bacon to booze to a re-order of toilet paper from Amazon Prime. How can local businesses use digital to drive more footfall or get local people to order from them online? From here, you will be about to ensure your business details are listed correct on Google. Location, opening times, contact details. Add photos of your team, the inside of your shop and maybe a few of our favourite customers. Once you’ve set up your business, make sure you verify it. Google will send out a postcard to your premises and all you have to do is type in a code. Simple. This will make you look legitimate and allow you to access other features of Google My Business. This is a fairly new feature, but allows you another route to share your content. Be warned, this content has a shelf life — so make an effort to update frequently. Once you’re logged into your businessgoogle.com account, use the menu to access the ‘Posts’ features here. If you use Google Maps already, you probably understand that pins indicate nearby landmarks, businesses or other places of interest you have searched for. 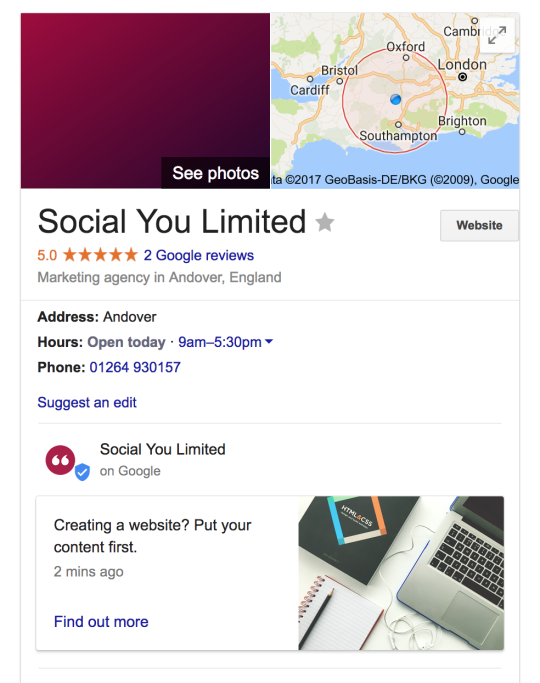 Once you’ve setup an AdWords account on Google (where you pay for ads) you will now be able to advertise on Google Maps with Local search ads. These will show as purple coloured pins. Finally, make sure your website works well on mobile — there is nothing more irritating that being unable to browse a site once you’ve found the product you’re after. This test will give you a quick indication of how you fair. Do the mobile test.